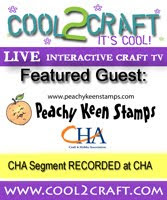 Welcome to Day #2 of our Blog Hop/Cross Promotion with Peachy Keen Stamps and SVG Cutting Files. It's sure been fun, and we've enjoyed sharing all these wonderful creations with you! Here's the card I created for today's festivities. For this sweet card, I used the "Cute As Can Bee" cut file from SVG Cutting Files. The base of my card is another great cut file from SVG Cutting Files, called Scalloped Open Card Base. I am so happy with how this turned out. For the face of this sweet little lady, I used the new PK-1200 Moodies Face Assortment stamps, and the PK-195 Honey Sentiments, both from Peachy Keen Stamps. I cut everything with colored card stock and did some shading with both sponges and Copic markers, EXCEPT for the hair. The hair was cut with (white) X-Press It Blending Card so that I could color and shade it with my Copics. The honeycomb is a Sizzix embossing folder, and the paper I used for that is Core'dinations (kraft core) card stock. I sanded the embossed edges lightly and sponged the edges with Tim Holtz Vintage Photo ink. I took some patterned paper scraps and punched little hexagon shapes to fit inside the embossed hexagons, and as a backdrop for this sweet little bee, I used the same patterned paper scraps to cut a circle and scalloped circle with my Spellbinders dies. The scalloped edge along each side of my card is done with a Stampin' Up! punch and the ribbon is also from my Stampin' Up! stash. I finished this card off with a little bling on her antennae, and down the side of the card. I ♥ HER and she is indeed as cute as can bee!! Now, this wouldn't be a blog hop if we didn't have some prizes for ya, and we've got that covered!! Both Peachy Keen Stamps and SVG Cutting Files are giving away a $35 Gift Certificate for each day of the hop! THAT'S a total of FOUR $35 Gift Certificates that you could win! All you need to do is leave a comment to be entered to win, but since we don't know which designer will be choosing a winner from their comments, you'll need to comment on each participating blog each day. THAT'S pretty darned easy, though, and especially considering all the FABULOUS creations that you get to see along the way from BOTH design teams!! Below, is a complete list of stops for Day #2 of our hop, just in case you should happen to get lost along the way. The final stop for this fabulous Blog Hop is at the Peachy Keen Stamps Blog. We'll end there, and we'd love it if you would leave a comment and let us know how you liked the hop! Thanks for dropping by, an HAPPY STAMPIN' to ya!! This came out adorable! Love the honeycomb, the color combo and her HAIR coloring!! Amazing!! Oh Lorie! This is beyond gorgeous! HER HAIR IS AMAZING! Beyond amazing really! The design of the card is fantastic and I love that big bow. BEAUTIFUL card lady! Your card is BEEutiful and I love her hair!!! This is an amazing card. I love love love her detail. You are so creative. Thanks for the inspiration. EEKKKKK Lorie! This is soooo cute! The hair looks real! and super shiny. you did and AMAZING JOB!! Every detail is just fab! Your card is as cute as can bee! The coloring is just AMAZING!!!!! LOVE it! Oh wow how cute and gorgeous coloring. I have to repeat what I just said on Emily's blog! I'm so jealous of all you ladies' talent!!!!!! I love the coloring you did with her hair!!! It looks so real!!! WOW!! This is a stunner!! Your coloring is amazing!! Your card is BEE-UTIFUL!! Candace's card and yours would make a great pair!! Great job!!! WOWZERS Lorie!!! This is "bee"-utiful....LOL!!!! I am in awe of your coloring skills and the adorable cut and PK stamps are awesome!! Thanks for sharing and have a GREAT Thursday!! So super cute! The hair that you colored is amazing! Thanks so much for sharing! This is my first hop and I've had a blast the last two days! Holy WOW!!!! I'm a total newbie at all of this. That was incredible work! My goodness Lorie! She CERTAINLY is CUTE as can BEE!! You should be proud, it is absolutely magnificent! You coloring is AMAZING! Awesome job, love the card! Okay my friend, Seriously Amazing creation and Awesome Idea. I think from now on I am going to try and do that with my Hair totally lifting that idea. Love this my friend you never disappoint. So glad to be in this hop. Wow!!! What a great card! I love the little girl and holy cow..your coloring is FANTASTIC! The embossing looks awesome and gives it such great texture:) Amazing job! This is so pretty. Love that big bow!! Love the color theme and scalloped frame. Super cute! She IS as cute as can Bee! As is the whole of the card. So gorgeous! Many wonderful details! Can I have it?! Wow you do awesome work. Just amazing. Yes, she is cute as can Bee! So many beeutiful details...I love it. The border punch, die cut, embossing, ribbon and bling are super. The inking and coloring are great and the hair is awesome. I like the hexagons punched and added to the embossing. Sweet job! Holy Moly did you do a fantastic job!!! Your card is so cute. Love it! TFS. that is so sweet!!! I always love your stuff! Fabulous card. Your coloring is amazing! ! this is flippen AMAZING !!!! Your coloring is soooooo awesome !!! the hair OMG ! just everything is adorable !!! WOW!! Your card is incredible!!! I did not really have time to do this blog hop today, but I am VERY glad I did! So many wonderful projects! Thanks so much for sharing! Wait.... I am still trying to pick my jaw up off the ground!! LOL!! Seriously, this has got to be one of my ALL TIME FAVORITE cards, like EVER!! The way you colored the hair is BEYOND amazing! I didn't even know it was possible to look that darn good! I love all the colors, patterns and textures you used, it's just perfect in every way!! Needless to say... I ABSOLUTELY, POSITIVELY LOVE LOVE LOVE THIS CARD!! OMG Lorie, this is adorable! Your coloring is flawless as always nd your color combo is perfect!!! Thanks for sharing yor ideas and talent with us! Love your card its so darn cute!!! This is RIDICULOUSLY amazing! Absolutely fantastic Lorie!! Oh Lorie, your card is absolutely darling!! I am always blown away by you incredible crafty projects..